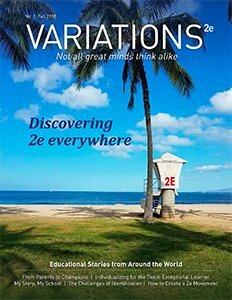 NOTE: A condensed version of this article was published as a “Direction to the Future” entry in 2e: Twice-Exceptional Newsletter, Issue 90. The full version of the article is below. It’s been 15 years since the first 2e Newsletter was published. The initial issue coincided with the publication of my book, Different Minds: Gifted Children with AD/HD, Asperger Syndrome and Other Learning Deficits. A lot has changed in those 15 years in terms of our knowledge and experience in working with gifted children who have a second exceptionality, but some things have not changed very much at all. Deirdre V. Lovecky, Ph.D. is a clinical child psychologist at the Gifted Resource Center of New England, Providence RI, where she does assessments, treatment and consultation for gifted children, adolescents and their parents. She is currently working on the Second Edition of Different Minds: Gifted Children with ADHD, Asperger Syndrome and Other Learning Deficits. She can be reached at GRCNE02940@aol.com.